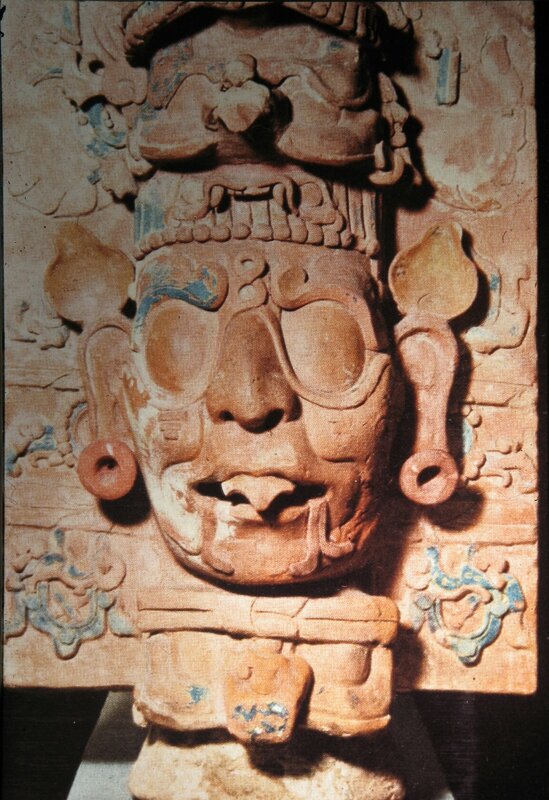 Solar Eclipse Was a Potent Time for the Mayas. This phenomenon was depicted in the Dresden Codex as a serpent with huge open jaws about to devour the solar eclipse glyph. 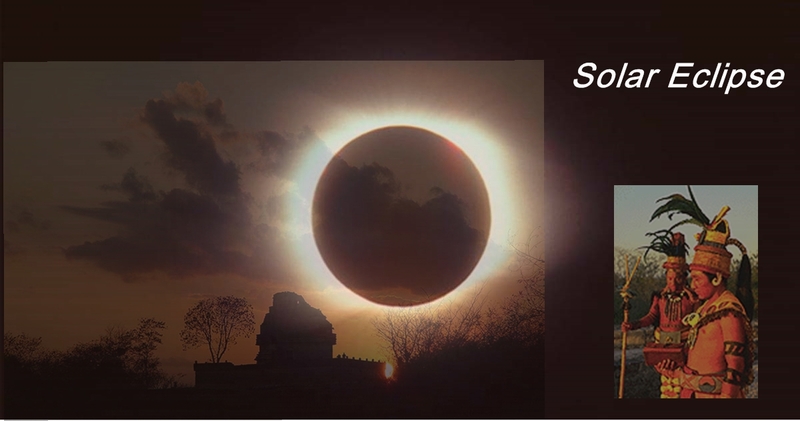 Although modern experts believe eclipses were a cause of distress for ancient peoples, terrifying because they did not understand the science behind such phenomena, this was not true for the Mayas. 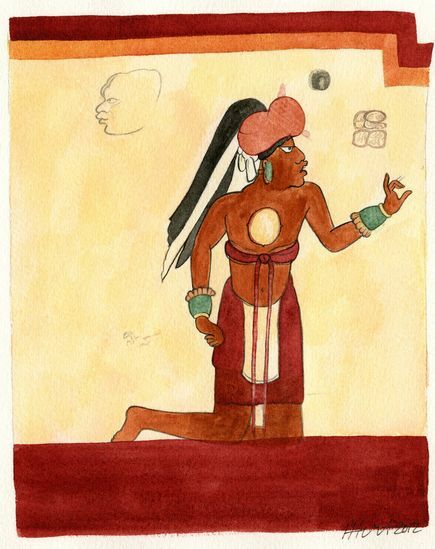 With their sophisticated knowledge of astronomy, the Mayas understood the movements of celestial bodies and how the moon moving between the sun and earth caused a brief blacking out of sunlight. To the Mayas, this held profound symbolic meaning, signaling a major shift of cosmic influences upon earth. Such potent occasions were prime time for ceremonies and invoking celestial powers into human actions. branches soared into the Upperworld of the cosmos. 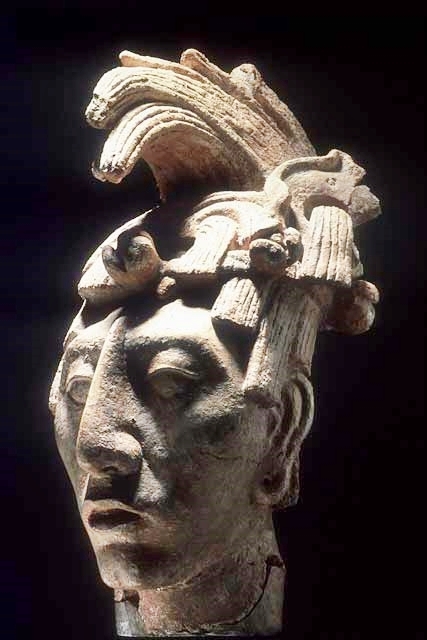 In Palenque, Pakal built a new temple in which to raise the Jeweled Sky Tree, since the original shrine was destroyed and desecrated in an enemy attack by Kalakmul during his childhood. Although the history of Palenque’s defeat by Kalakmul is well known (Stuart & Stuart), and Pakal’s mandate to restore the damaged portal to the Upperworld has been described (Aldana), the actual process of resurrecting the Tree is a mystery. My task as an author of historical fiction was to use informed imagination to envision this process. This I did through the character of Pakal’s wife, Tz’aakb’u Ahau (Lalak in my story, called The Red Queen), whose training in sexual alchemy brought the immense power of life creation to join with Pakal in “conceiving and birthing” a new Wakah Chan Te. (Martin) To further enhance the potency of this event, the ceremony was enacted during a solar eclipse. 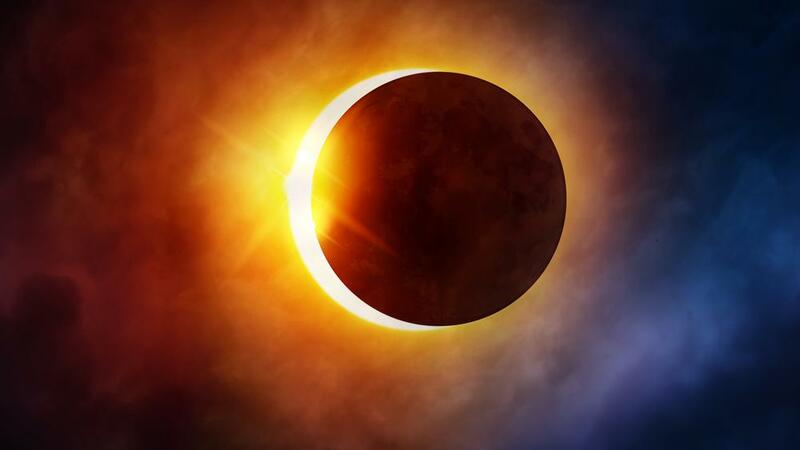 Historical records show there was a solar eclipse that crossed over Guatemala and southern Chiapas on February 2, 650 CE. 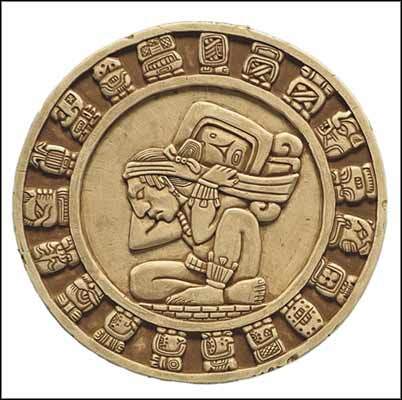 Palenque, located in Chiapas, would have experienced at least partial solar eclipse between 1:00-4:00 pm that day, which worked perfectly for the ceremony done by Pakal and Lalak and resulted in the climactic moment of their story. 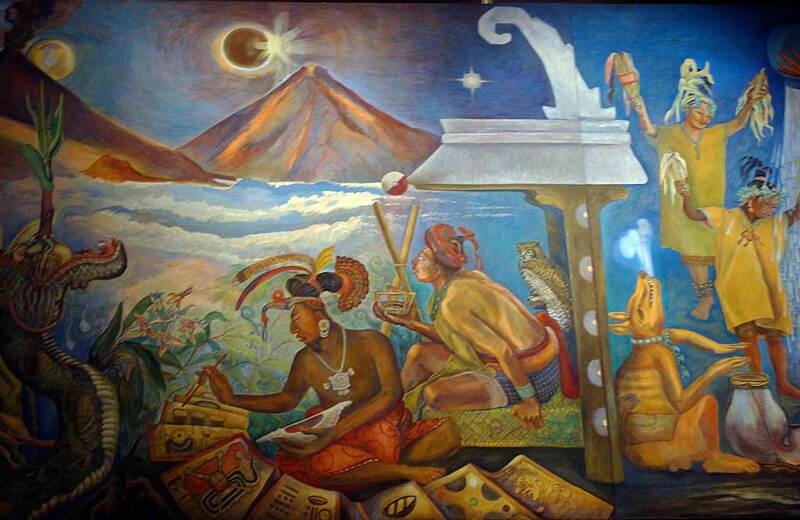 How the Mayas predicted solar eclipses. Predicting lunar and solar eclipses is more complex than determining sunrise, sunset, solstice, and equinox. Movements of the earth, the sun, and the moon all must be taken in to account because this involves correlating the synodic lunations with the solar calendar. Because the orbital plane of the moon is inclined by 5 degrees to the plane of earth’s orbit, eclipses do not happen at every full and new moon. Rather, they take place only when the moon enters the ecliptic plane at the same time that it is in correct position between the sun and earth. folding bark-paper book with pages coated in thin stucco, with glyphs painted in red and black and many symbolic figures. There are tables containing predictions of the phases of Venus over a 104-year interval, and predictions of lunar phases for 33 years. The Mayas used these to calculate solar eclipses. The average interval between solar eclipses is 153.79 days. They had calculated a synodic lunar period as 29.533 days (modern value 29.530 days). Since the Mayas did not use decimals, they varied between 28 and 29 days for lunations. A grid of dates in the Codex linked Venus phenomena with lunar nodes to predict solar eclipses. Using the derived multipliers they were able to determine solar eclipse intervals that varied by +7 and +8 days. Combining an inferior conjunction of Venus with the predicted solar eclipse gave better accuracy. Had the Classic Mayan civilization continued, undoubtedly they would have predicted our current eclipse occurring on August 21, 2017. Aldana, Gerardo. The Apotheosis of Janaab’ Pakal. University of Colorado Press, 2007. Bricker, Harvey & Bricker, Victoria. 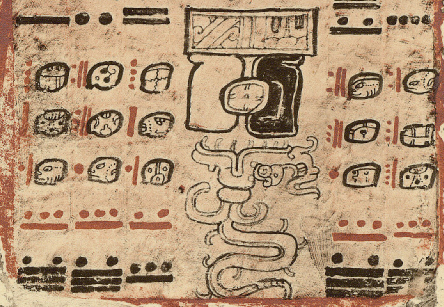 Astronomy in the Maya Codices. American Philosophical Society, 2011. Martin, Leonide. 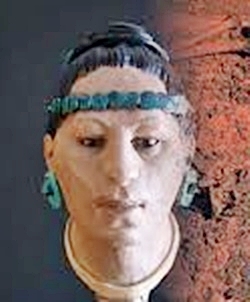 The Mayan Red Queen: Tz’aakb’u Ahau of Palenque. Made for Success Pub., 2015. Stuart, David & Stuart, George. Palenque: Eternal City of the Maya. Thames & Hudson, 2008. The ancient Maya city Palenque (Lakam Ha) had a unique creation myth that linked the origins of their ruling dynasty to primordial goddesses and gods. 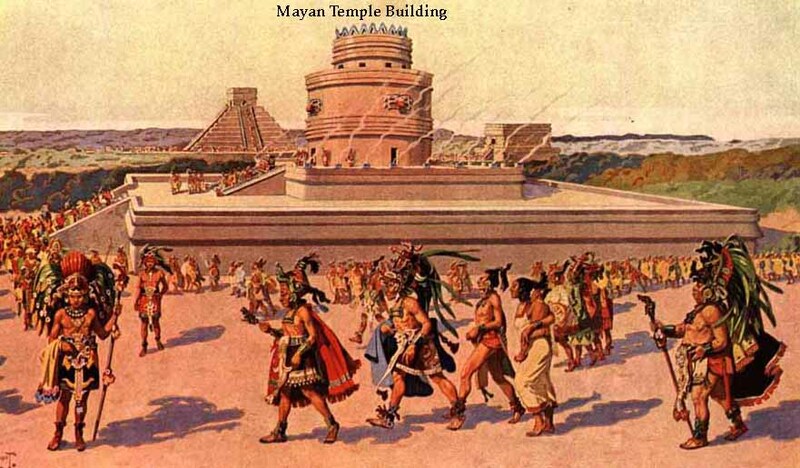 The movements of the sun were particularly important to the ancient Mayas. The Mayan Red Queen is Here! 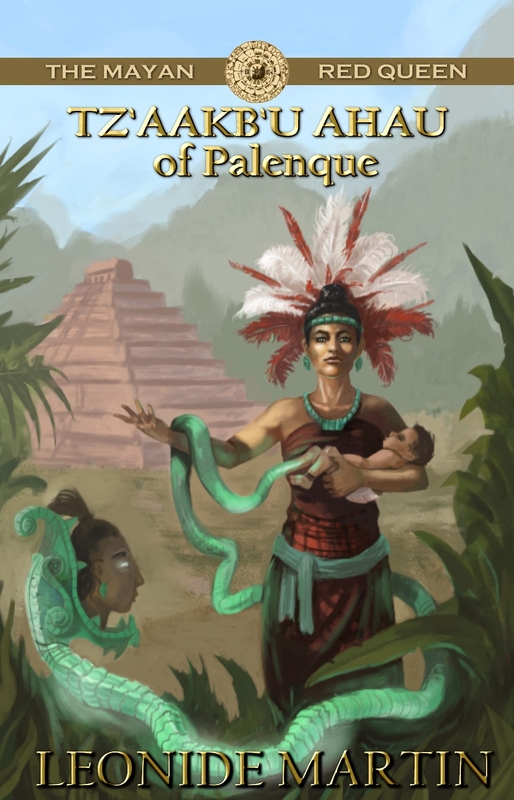 Mists of Palenque Series – Book 3. Ancient Mayan civilization comes alive in historical fiction. Maya ruins restored to their glory in Palenque (Lakam Ha). Just published as ebook on Amazon. Book 3 in the series about Mayan Queens. 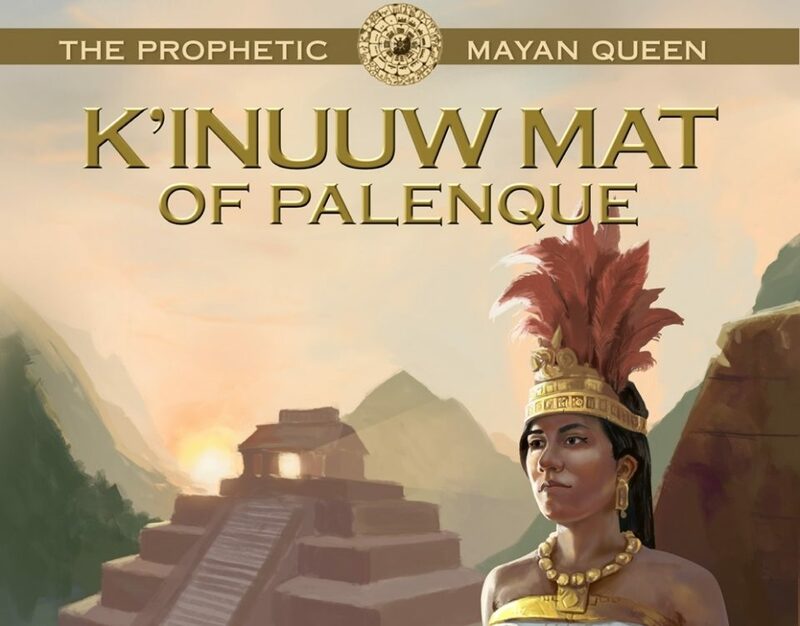 In the third Mayan Queens book, the ancient Mayan city of Lakam Ha (Palenque) has a new young ruler, K’inich Janaab Pakal. been banished from the city by his mother. Simmering conflict and tragic losses besiege their relationship, until Lalak is compelled to claim her rightful place. She envisions how she can play a pivotal role in Pakal’s mission to restore the spiritual portal to the Gods that had been destroyed in a devastating attack. Through learning sexual alchemy, Lalak brings the immense creative force of sacred union to give rebirth to the portal. But first, Pakal must come to view his wife in a new light. 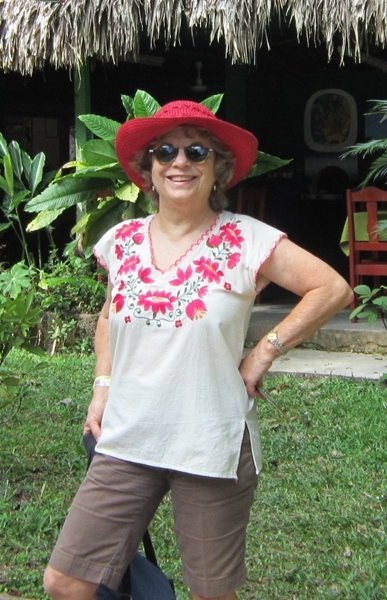 Modern archeologist Francesca, ten years after discovery of the Red Queen’s tomb, continues her research on the mysterious crimson skeleton found in a temple adjacent to Pakal’s burial pyramid at Palenque. She teams up with British linguist Charlie to decipher an ancient manuscript left by her Mayan grandmother. 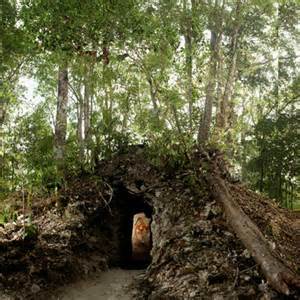 It gives clues about family secrets that impel them to explore what a remote Mayan village can reveal. I hope you will read The Mayan Red Queen. It will take you deeply into the world of the ancient Mayas during the height of their civilization, set in the most mysterious and beautiful city of the Classic Period. You will meet fascinating historical figures and follow the unfolding of actual events as Pakal’s dynasty spreads influence in its region and his city gains widespread acclaim as a vortex of artistic expression. You’ll be intrigued by the workings of Mayan shamanism and Lalak’s mastery of sexual alchemy to raise the Jeweled Sky Tree (the sacred portal). And, you’ll experience elegant high court protocol, esoteric Mayan calendar ceremonies, harrowing Underground encounters with Death Lords, and an exquisite love story of the most powerful royal couple in the Americas. Historical fiction fans will also enjoy the first two books of the series, about the grandmother and mother of Pakal. Each story stands alone, but you gain additional richness when you read them in succession. In the steamy jungles of Guatemala, a team of archeologists led by Boston University’s William Saturno returned in 2011 to a little known site named Xultun. The site has been dated to the 9th century. A member of the team, Max Chamberlain, had been working on a modest building within a residential area that had a large looter’s trench dug through its middle. In March 2010 Max saw the remnants of a wall mural on the west wall of this building, exposed by the looter’s trench. Maya ruins at Xultun were first reported in 1915, and expeditions went in the 1920s and again in the 1970s to map the site’s monuments. These expeditions did not find much except crumbling structures, and over the years looters repeatedly raided the site for artifacts. Saturno’s team in 2010-2011 was not expecting to find much left, especially not wall murals. Max’s building was certainly not one where archeologists anticipated finding wall murals. It was close to the surface rather than deep inside a building complex. Murals are delicate and do not last in the humid lowlands climate. 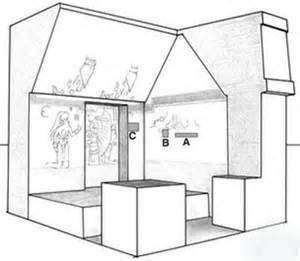 The room was a small structure, six and a half feet wide by six feet long, with a 10 foot tall vaulted roof. The ancient Mayas modified it over several construction phases, the most recent one filled the room with rubble and earth and the final phase was built over it. One remarkable thing was that the Mayas filled in the room through the doorway, rather than collapsing the roof to fill its interior so they could build over the top of it. This method served to preserve the murals inside quite well. The looters carved their trench into the room looking for a tomb, which they did not find. 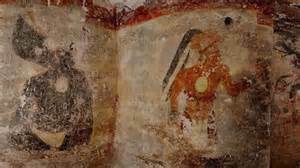 They abandoned their search, leaving a portion of the west wall paintings exposed to weather. It was this faint and barely perceptible mural that Max Chamberlain saw. A surprised William Saturno confirmed that Max was indeed seeing murals. 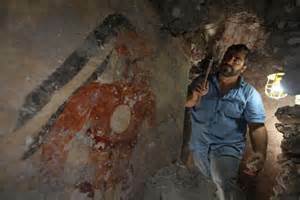 The team continued excavating and during 2011 they cleared out the debris to reveal that three interior walls and the ceiling were covered by murals. The state of preservation varied, depending on how close the murals were to the exterior surface. Looking through the doorway into the room, you see a series of life-size figures seated on the west wall. 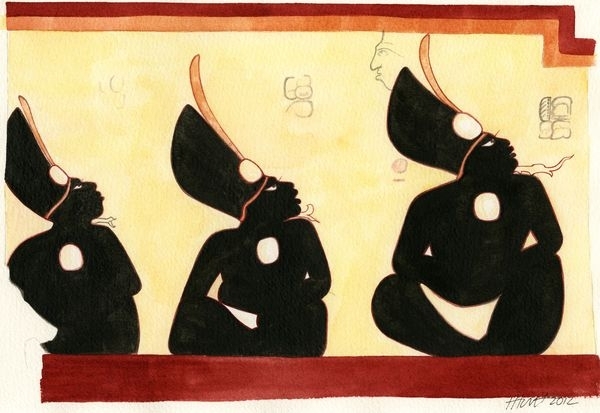 Their bodies are painted black and they all wear the exact same costume, a white loincloth and a large black “bishop’s miter” hat with a single red feather on the top. These three figures look upward and towards the north wall. On the north wall is another figure painted in orange. He has a more elaborate costume with headdress and jade wristlets. 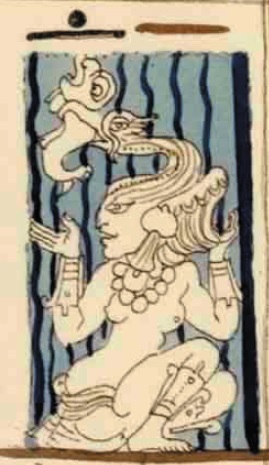 His hand is outstretched holding a stylus, pointing towards another seated figure, the ruler of Xultun. In the center of the room is a stone bench where the ancient Maya would sit. All the east wall and part of the north wall is covered with numerous small, delicately drawn hieroglyphs of various sizes painted in black and red. These glyphs and bar-and-dot numbers arranged in vertical columns resemble the astronomical charts and ephemeral calendars seen in the Dresden Codex, an ancient Maya screen-fold manuscript originally written in the 11th to 12th century. At the top of these columns are moon glyphs combined with lunar deity heads, followed by columns of three numbers that record elapsed days using periods of the Long Count calendar. Analysis of the numbers showed they calculated lunar semesters, a way the Mayas tracked lunar cycles and predicted eclipses. A set of 27 columns of these lunar tables span across the wall. To the left of the lunar series, incised thinly over a painted mural figure, is a “ring number.” The only other place ring numbers appear is in the Dresden Codex. This is a count of days with the lowest number circled, making a ring around the number. The lowest number would be the day (kin), indicating how many days to subtract from the current Maya cycle start date of August 11, 3114 BCE. To the Mayas this date is 13.0.0.0.0 4 Ahaw 8 Kumk’u. 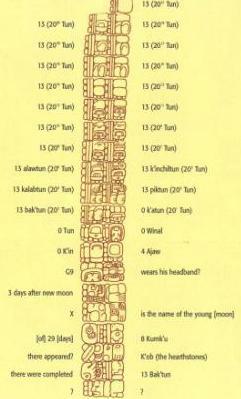 It is not clear how the Xultun astronomers were using ring numbers, but these can be linked to lunar cycles. large. 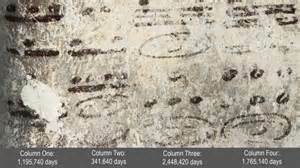 Similar lengthy tallies of days appear as Distance Numbers in the Dresden Codex and on carved monuments. It is possible these tables serve astronomical ends, since they are divisible by 52 (Calendar Round) and 260 (Tzolk’in Calendar). One column contains day numbers that are even multiples of 584, the Maya calculation for the cycle of Venus. Another has numbers evenly divisible by the Maya 819-day cycle related to synodic periods of Jupiter and Saturn. These Long Count style calculations take you back in time as far as 3207 BCE and as far into the future as 3136 CE. updated periodically from observational data of eclipses, lunar and planetary cycles. 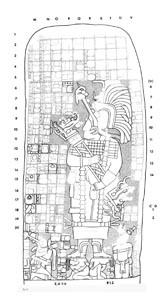 The Xultun murals are the earliest example yet found of such Maya astronomical calculations. 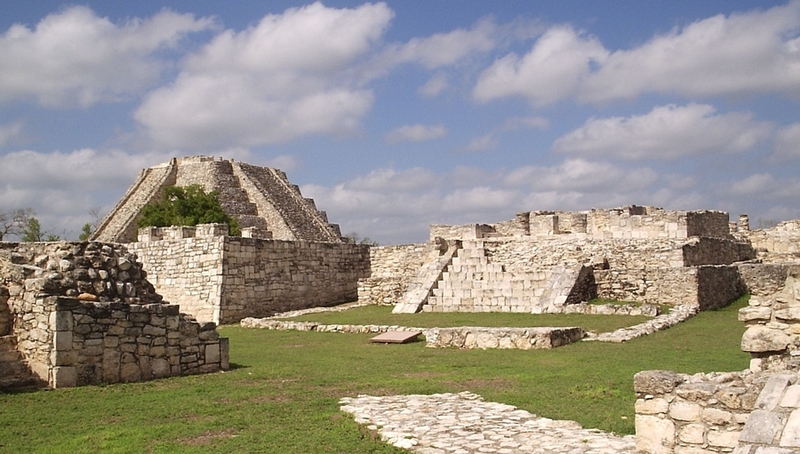 Did Saturno and Chamberlain discover a Classic Period ancient Mayan astronomical academy? Because of the small building’s characteristics, it might have been part of a residence for astronomers. You can imagine them gathered in the room, perched on the stone bench and painting their intricate glyphs and numeric calculations with black and red plant dyes on the fresh stucco wall. One man dressed more elaborately, perhaps the ruler’s scribe, poises his stylus waiting the ruler’s words. 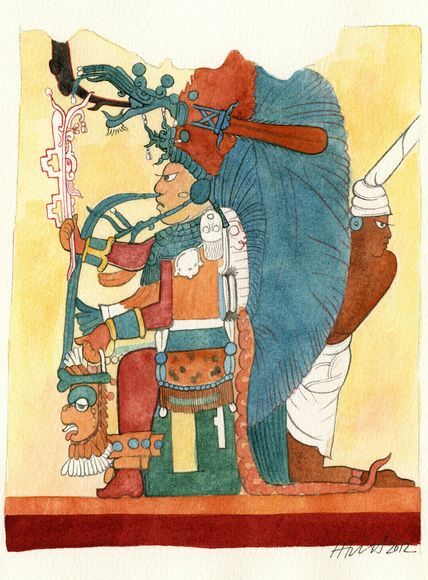 The ruler in trance, channeling a Maya deity, reveals mystical understandings of sacred calendric cycles that the astronomers will use in making their calculations. The ancient Mayans had the world’s most accurate calendar. Many dates carved at Mayan ruins reveal how Mayan civilization used calendars. This calendar called the “Count of Baktuns” keeps a continuous count of days from the beginning of the last Great Cycle, when the Mayas say our current human race was created. Archeologists call this the “Long Count.” Although the Long Count Calendar seems a linear recording of days, actually it is a cycle, in keeping with the many other cycles that shaped Mayan culture. The Long Count is a large cycle of 5125 years or 5200 tuns. The tun is a 360-day count that is referred to as a Maya year. 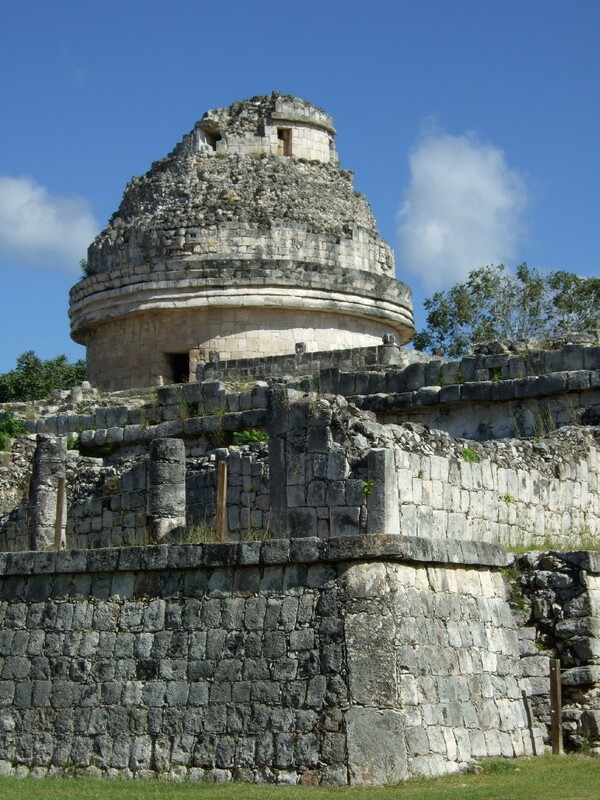 The ancient Mayans knew the solar year was slightly longer. By their calculations it was 365.2422 days, closer to the sun’s actual annual movements than the Gregorian calendar’s 365.2425 days that we now use. The genius of the Long Count is its ability to record time into the fathomless past and the infinite future. The levels of counting used by the Mayas acted logarithmically, so progressively higher counts become huge very quickly. Theirs is a base-20 or vigesimal system (we use a base-10 system). There are carved stelae in plazas and panels in Mayan pyramids that record dates going 28 octillion years into the past and over four thousand years into the future. These huge cycles appear multiple times in the Dresden Codex and inscriptions of Palenque, Copan, Quirigua, Tikal, Yaxchilan and Coba. Let’s try to get some idea of how huge these Long Counts are. to that creation day of 4 Ahau 8 Kumk’u. 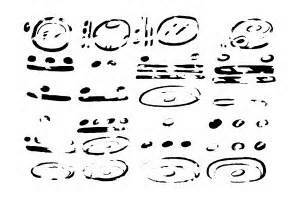 Other glyphs on the stela record the lunation phase of the moon and the assigned God of the Night. Then starts a progression of 13’s in the higher order count that each signify completion of a Great Cycle. There are 20 of these 13’s above the creation date. If you do the math, going up by a magnitude of 20 at each step, the date becomes 28 octillion years in the past! That’s a count that goes eight levels above a billion years – the number is mindboggling and far beyond the age that scientists calculate for our universe. 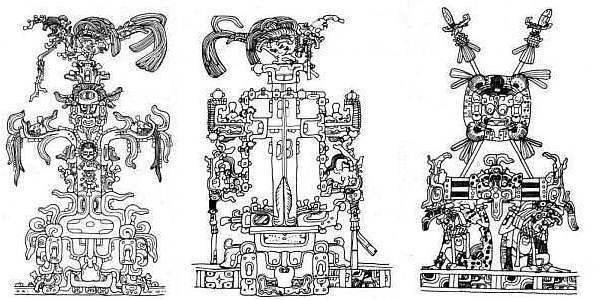 Other immense past dates appear in the Dresden Codex that records a count of 13 consecutive 13’s, and Temple 33 at Yaxchilan that has a panel with 10 of these 13’s above a contemporary date. things as the Iron Age, the Renaissance, and the Industrial Age which do not have clearly demarcated time lengths. It’s possible the Mayas were doing something similar with their string of 13’s. The last “era” or creation began when the calendar rolled over from 12.19.19.17.19 (August 12, 3114 BCE) to 13.0.0.0.0 (August 13, 3114 BCE). They also used counts that topped out at 13 Baktuns for divination, since the divinatory days only go to number 13. The Count of Baktuns or Long Count gives a timeline that goes through all of Maya history, and into mythological time both past and future. The earliest known Long Count dates were carved in 31 BCE at the Olmec site of Tres Zapotes, and in 36 CE at the Maya site of Chiapa de Corzo in the Highlands of Chiapas, Mexico. The last date was carved in 909 CE at Tonina in Chiapas. The Mayan calendar shaped ancient Mayan culture. Mayas thought of time as divine and eternally flowing without beginning or end. Time and space were two aspects of the same divinity. The Underworld of watery deities and Death Lords, the Middleworld of human, plant and animal life, and the Upperworld of sky deities and Star Lords were the spaces for actions, both human and divine. Space became the platform on which the handiwork of the gods played out. All deities acting in a space were the changing faces of time. Time was life and the origin of all things; therefore to study and measure time was the supreme concern of calendar priests, called Ah K’inob. To understand and follow the cycles of time was paramount to ancient Mayan civilization. The ancient Mayans discovered cycles of time and invented ways to measure them, both immense and small. They developed calendars to track cycles of the days, moon, sun, Venus, Mars, Pleiades, Orion, and other stellar bodies. They followed the cycles of precession of the equinoxes and movements of the Milky Way, which they called the Celestial Caiman. These cycles with their intrinsic order ruled what happened in the universe. Patterns in the stars were repeated on earth, and ruled the cycles of life and creation. Making observations of stellar patterns and doing computations that predicted recurrent cycles enabled the Mayas to foresee the actions of the gods. These time cycles were turned into formulas for ritual and worship. Ceremonies to honor important time periods were held with mathematical rigor, and inscriptions carved to commemorate these moments when actions of the gods left their imprint on the world. The calendar priests calculated tables for lunar and solar eclipses, Venus as morning and evening star, Mars return cycles, the Pleiades and sun at zenith, and the equinoxes and solstices. 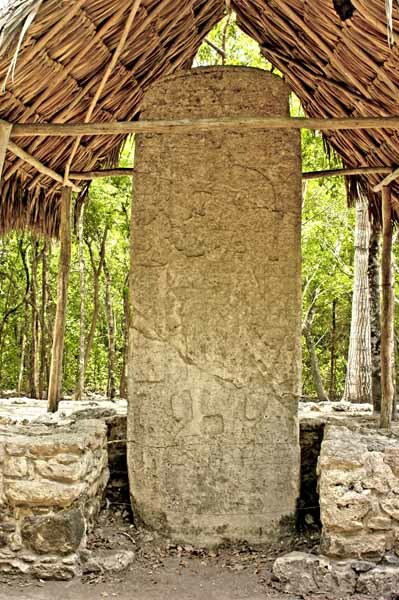 In effect, these tables allowed the Mayas to dialogue with the gods, scheduling rituals at the ordained times because they already knew the divine sequence of the universe. They fulfilled their contract with the gods to keep their days and honor their names. The entire life of the Mayas was governed by time. Their architecture, ceremonies, mythology and religion all reflected the theme of time. The main plaza of cities had buildings oriented to the four directions to express the quadripartite universe shaped by movements of the sun and stars. Art and symbols are replete with expressions of time, and numerous deities were Lords of Time. The sciences of Mayan astronomy and astrology are tied to the extraordinary precision of their calendars. They created a 13-constellation zodiac and tracked the Precession of the Equinoxes that has a 25,000 year cycle. Time was their worldview. Nothing could exist without time. The Mayan calendars codified time to determine all great and small actions of every day. Experience how the Mayans related to time in my historical novel: The Visionary Queen: Yohl Ik’nal of Palenque.